Start spring with a cool drink, a gentle breeze, and an historically delicious treat. This April, celebrate National Soft Pretzel Month. Whether salted, seasoned, dipped, rolled, or served as is, soft pretzels provide the scrumptious, guilty pleasure that our taste buds crave. No matter if you’re grabbing a quick bite on the go, kicking back at a ballgame, or just enjoying a tasty snack, this twisty treat always seems to satisfy. Federal Pretzel Baking Company created the first machine-produced stamped-cut soft pretzel. Southern German and Swiss German immigrants, who became known as the Pennsylvania Dutch, introduced soft-shaped pretzels with different shapes. Catholics once considered pretzels the “official food of Lent," and by the 16th century, it became a tradition to eat pretzels on Good Friday. According to legend, an Italian monk invented pretzels as a reward for children who learned their prayers. Nothing's off-limits when it comes to pretzel dip, so go ahead and experiment. Whether it’s caramel, cheese, mustard, sweet glaze, cream cheese, or your own personal invention, you can’t go wrong. With a few simple ingredients, a few kitchen tools, and an oven, you can easily make your own soft pretzels. Invite a few friend over to see who can fashion the best tasting, most creative, and mouthwatering snacks to share. Buy me some peanuts and Cracker Jack? Sure! But save room for a pretzel during the late innings. Philadelphians consume approximately 12 times as many pretzels annually as the national average. Worldwide, a billion dollars worth of pretzels are sold each year. On New Years Day in ancient Germany, children would hang pretzels around their neck in order to bring good luck into the new year. About 80% of pretzels in the U.S. today are made in Pennsylvania. Soft pretzels have become a staple at entertainment venues such as movie theaters, arenas, concert halls, and stadiums. Philadelphia's credited with introducing the first American soft pretzel. The pretzel has become an element in popular culture. 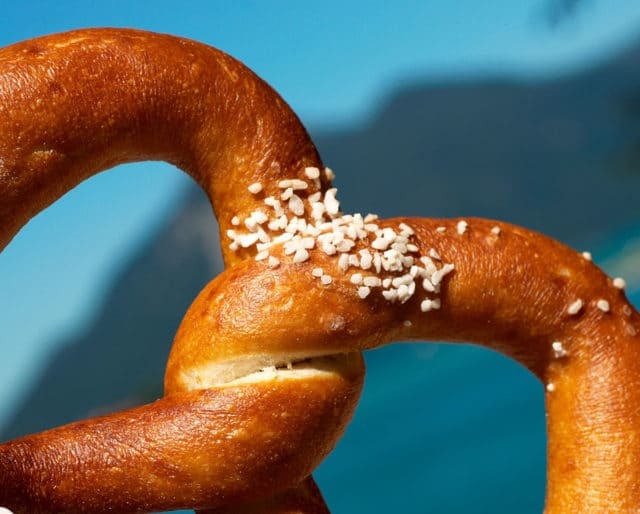 More than just a popular food, the pretzel’s unique knotted design has inspired architectural and artistic ideas, perspectives, attitudes, and images.